Connecticut hits 12 3-point shots in Minneapolis to hand Lynx second straight home loss. Jasmine Thomas launches a shot for two of her 11 points on the night. 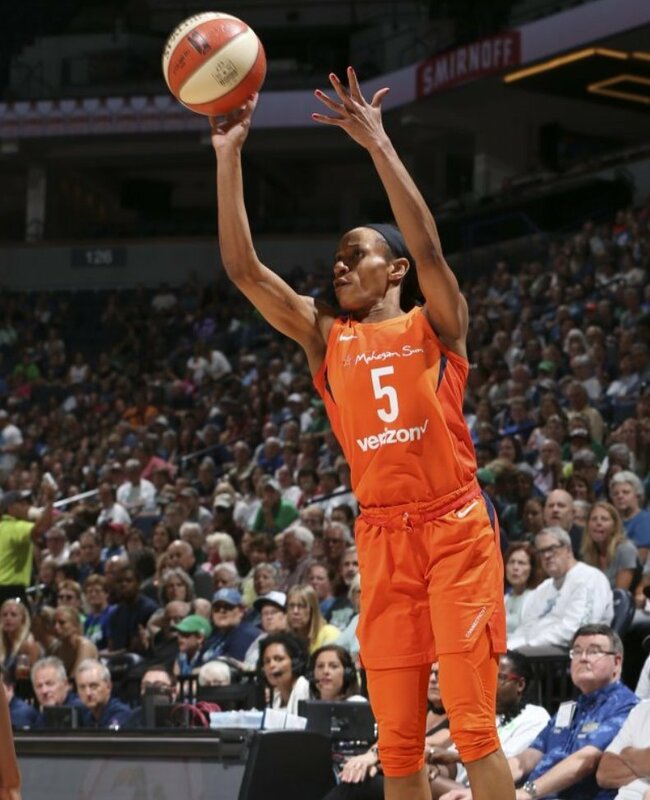 Photo courtesy of Connecticut Sun. Minneapolis – The Connecticut Sun brought out all their weapons Sunday. Morgan Tuck came off the bench to lead six Sun players in double figures, with 15 points; shooting guard Courtney Williams had a team-high eight rebounds to go with her 10 points; and the team shot a blistering 48 percent from beyond the arc in their 83-64 rout of the Lynx. It was the second straight win for Connecticut and the second consecutive loss for Minnesota in an up-and-down season for two teams that began with high expectations. And ironically, the game gives each team a 12-10 record and ties them for seventh place in league standings. Sun coach Curt Miller said his team was ready for the Lynx, knowing they’d be hungry to avenge their last loss, also at Target Center. 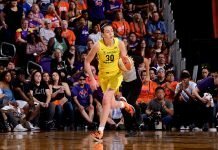 Miller said Connecticut also took advantage of the absence of Minnesota starting forward Rebekkah Brunson, who has now missed three games with a hamstring injury. Sylvia Fowles was the lone Lynx player in double figures, with 12 points. The team’s other top-scorer, Maya Moore, had a season-low five points. The match up was closely-fought in the first quarter, with the visitors taking a 24-20 lead into the break. But in the second period they began to blow the game open, and continued their assault in the third frame, holding their opponents to one field goal for the first five minutes. The fourth quarter saw the Sun inflate their lead to as much as 31 points before Minnesota began chipping away against their opponent’s bench, as the starters sat the entire ten minutes. After the first 10 minutes of play, few could have predicted the lopsided final score – especially with the hosts having everything to prove after a loss. But back-to-back three-point shots by Minnesota Gophers legend Rachel Banham gave Connecticut a six-point lead. The hosts had trouble regaining their momentum. Tuck credited team play for the win. Even with Chiney Ogwumike playing limited minutes in foul trouble, the Sun had a 41-27 rebounding advantage on the night. The Lynx successfully held forward Alyssa Thomas to two points, but the rest of her team stepped up to erase the difference. Connecticut began the season hot, going 8-1 before stuttering as Thomas was injured and had to sit out. Defending champion Minnesota went 3-6 before winning seven straight. Now they are inconsistent, at best, with no one seeming poised enough to step up for longer than a couple of possessions at a time. Reeve said the team had planned to win at home before going on the road. The Sun head home to host the Atlanta Dream Tuesday, while the Lynx face the Indiana Fever at home.